1 anime images in gallery. Tagged under Maya and Parasite Eve. 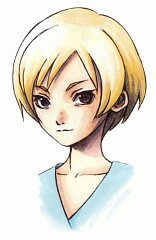 Maya Brea was Aya Brea's deceased twin sister that died along with her mother in a car accident. Because Aya needed a cornea transplant, Maya's cornea was removed and given to Aya, thus causing Maya's mitochondria to reside within Aya. Maya's memory of her death was appearing right before Aya. Her kidney was also given to Melissa Pearce, who would later on become the 2nd Eve.